Editor’s Note: Kane County is the home to 24,787 veterans, the seventh-largest county by veteran population in the state of Illinois. This article was compiled with the help of Kane County Veterans Assistance Commission Superintendent Jacob A. Zimmerman in appreciation of our veterans’ service and sacrifice. Looking for a way to honor the fallen heroes of our communities or enjoy a day of parades and festivities with friends and family this Memorial Day weekend? Below is a list of some of the many events taking place in Kane County, IL. Of course, government offices are closed on Monday, and U.S. and state flags are to fly at half staff from sunrise to noon, by order of Gov. Bruce Rauner. MEMORIAL DAY CEREMONY, 10:30 a.m., Riverfront Park, 201 N. Harrison St., Algonquin. The ceremony will include an opening prayer, guest speakers and patriotic songs. Master of ceremonies will be Navy veteran Gary Jenson. Guest speakers include both presidents from the villages of Algonquin and Lake in the Hills, Russ Ruzanski and John Schmitt. Other speakers will be Algonquin residents Christine Chunn and Jim Castellano. A wreath will be laid in the water and a POW/MIA flag placed over an empty chair. There also will be a 21-gun salute, followed by the playing of echo taps by two Jacobs High School students. The ceremony will end with a closing prayer. Hosted by Lake in the Hills American Legion Post 1231. Information: Jim Mertz, 847-658-3363. WWI MEMORIAL EXHIBIT OPENS — The city of Aurora’s Grand Army of the Republic Memorial Museum and the Aurora Historical Society are proud to present “With the Colors From Aurora: A Memorial to the First World War,” on display in the David L. Pierce Art and History Center, 20 E. Downer Place, Aurora, IL 60506, from May 29, 2017, to Jan. 6, 2018. This temporary exhibit explores the experiences of those living in Aurora, IL, during World War I, as recorded in the memorial book With the Colors From Aurora, which was published in 1919. The exhibit features excellent examples of World War I weaponry, military uniforms, Red Cross uniforms, war souvenirs, and propaganda posters. This informative and interactive display is appropriate for all ages. “With the Colors From Aurora: A Memorial to the First World War” opens on Memorial Day, May 29, 2017, with a doughnut-and-coffee reception from 10 a.m. to 2 p.m. The opening reception coincides with the City of Aurora’s Memorial Day events and parade. The David L. Pierce Art and History Center is open to the public free of charge from noon to 4 p.m. Wednesday through Saturday. MEMORIAL DAY PARADE AND CEREMONY — The city of Aurora will honor the service men and women who gave their lives for our country during the annual Memorial Day ceremony and parade on Monday, May 29, 2017. The pre-parade ceremony — In Memory of Many, In Honor of All — will be held at 11:30 a.m. at the reviewing stand in front of the Pierce Art and History Center, 20 E. Downer Place. The parade steps off at noon from River and Benton streets, heads east to Broadway Avenue, turns north to Downer Place and concludes at River Street. The best viewing area will be the in front of the Pierce Art and History Center. 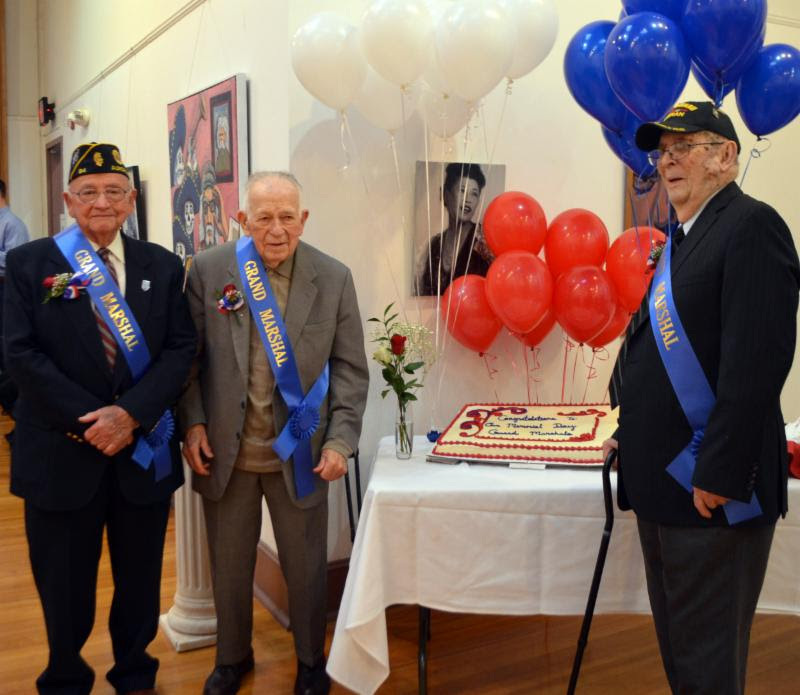 WWII veterans Ray Moore, Bill Moore and William Wallbaum will serve as grand marshals. Leading the parade as Grand Marshals will be World Ward II Veterans Bill Moore, Ray Moore and William Wallbaum. Bill Moore earned a commission with the U.S. Navy, rising to the rank of Senior Lieutenant in the British West Indies then came to Aurora, where he would later help to found public accounting firm Sikich. Ray Moore served as a tail gunner on a B-17 “Flying Fortress,” for the Army Air Corp, and continues to be active in veteran’s organizations today, including the VFW, American Legion, and Burlington Veterans. William Wallbaum, served as a member of the 1271 Combat Engineers Battalion in France, Germany and Austria before returning to Aurora to teach and coach at his alma mater, West Aurora High School. The 2017 Memorial Day Parade will also feature local military groups, including the Roosevelt Aurora Post 84, Amvets Post 103, Waidley VFD #468, Fox Valley Marines, GAR Commission Post #20, and the 36th Illinois Infantry volunteer re-enactors. Five marching bands — from East Aurora, West Aurora, and Metea Valley High Schools, and Granger and Hill Middle Schools — and other crowd favorites such as the Lamplighters Chorus, the Aurora Shriners Club, the East Aurora NJROTC, Aurora 88’s Roller Derby League, Simply Destinee Dance Team, the crowd-electrifying South Shore Drill Team and more will also step off through downtown Aurora. The traditional Memorial Day service will begin at 10 a.m. May 29 inside the Batavia VFW banquet facility at 645 S. River St. (Route 25) in Batavia. The program will include patriotic music played by the Batavia Community Band and a keynote address by returning speaker David Holm, a language arts teacher at Rotolo Middle School in Batavia. The Viking Lodge will serve a herring breakfast, which begins at 7 a.m. and continues until sold out, usually around 10:30 a.m., according to organizers. The cost is about $9. The annual Memorial Day Parade and Program is organized by the Tri-Cities VFW Post 2298 in West Dundee. The parade steps off at Van Buren Street in East Dundee at 2 p.m. Sunday, May 28, 2017, and progresses westward to Grafelman Park in West Dundee. A program remembering the people who died while serving in the country’s armed forces will follow in the gazebo at Grafelman Park. American Legion Post 630 – in cooperation with Blackberry Township and the city of Elburn – will host a Memorial Day ceremony to honor the nation’s fallen at Blackberry Township Cemetery, located at the corner of Keslinger Road and Route 47. The event will take place at 10 a.m. May 29; however, if there is inclement weather, the event will take place at the Post 630 Hall, 112 N. Main St, Elburn. American Legion Post 630, in cooperation with Elburn Boy Scout Troop 7, will host a pancake breakfast at the post hall, located at 112 N. Main St. in Elburn, from 7 to 9:30 a.m. May 29. Elgin, IL- The Elgin Patriotic Memorial Association in cooperation with the City of Elgin will host four events for Memorial Day on Monday, May 29, 2017. There will be a Catholic Mass along with a combined color guard, rifle salute, and the playing of Taps. A service to honor those buried at Lakewood Memorial Park will be held at the cemetery’s Garden of Honor and include a combined color guard. The observance will conclude with a rifle salute and the playing of Taps. Organized by the Elgin Navy Club and the Elgin Marine Corps League, this program is especially designed to pay tribute to veterans interred at sea. This year’s keynote speaker will be Col. Sheldon J. Bathurst, a retired U.S. Marine who served in Vietnam. The program will also feature the Elgin Master Chorale, and conclude with the strewing of flowers into the Fox River, a rifle salute, and the playing of Taps. This year’s program will pay tribute to the 125th anniversary of the Elgin Patriotic Memorial Association. The keynote speaker will be Elgin historian Jerry Turnquist who will reflect on the organization’s history as well as past Memorial Day ceremonies. This program will also include the Elgin Master Chorale and Elgin High School Band. Local students will continue the long held tradition of reading Lincoln’s Gettysburg Address and General John Logan’s Orders, which established Memorial Day. The most solemn moment of the morning will be the laying of organizational wreaths at the Grand Army of the Republic memorial – an observance akin to the laying of wreaths at the Tomb of the Unknowns in Washington D.C. Activities will include a roll call of deceased veterans, a rifle salute, and the playing of Taps. Additional notes: A free shuttle bus will pick up riders at the main gate and east gate before and after the service for transportation to and from the ceremony area. This 11:00 a.m. program will also be broadcast live on WRMN Radio, 1410 AM. Should weather conditions be deemed unsuitable by city officials for outdoor programs, an announcement will be made no later than 8:30 a.m. on Memorial Day, Monday, May 29 that the Veterans Memorial Park and Bluff City Cemetary programs will be held at their normal times at the Hemmens Cultural Center located at 45 Symphony Way, Elgin. This information will be posted on the City of Elgin website and other media outlets. Residents are encouraged to visit local cemeteries over Memorial Day weekend. At Bluff City Cemetery, over 600 flags honoring local veterans will line the streets as part of the award winning “Avenue of Flags.” There are also over 2,800 smaller flags flying over veterans graves placed by local volunteers as part of the “Adopt a Cemetery” program. For more information on these events, visit elginmemorialday.org. Anyone traveling through Geneva this coming Memorial Day weekend should plan accordingly for two events that will temporarily close streets on the city’s west side and downtown. Bricher Road west of the Geneva Commons to Peck Road. Delnor Hospital’s campus, 300 Randall Road, will be accessible from Keslinger Road. The Fisher Farms subdivision, west of Fisher Drive, will be open at Keslinger Road, Heartland Drive and Prairie View Drive. Geneva Police officers and race officials will assist residents living east of Fisher Drive, north of Williamsburg Avenue, in leaving or entering their street. Traffic control will attempt to limit the inconvenience as much as possible, but people should expect significant delays while runners and bicyclists are on the roadway. Beginning at 10 a.m. Monday, May 29, the American Legion Fox River – Geneva Post 75 will step off its annual Memorial Day Parade from the Geneva Train Station. The parade will feature the color guard, local veterans, City officials, Boy and Girl Scouts, Geneva High School Marching Band, military re-enactor units and Geneva Police and Fire vehicles. The procession will travel north on Third Street to the West Side Cemetery, Third and Stevens streets, where a Memorial Day ceremony will be held. Third Street will be closed during the parade as will the intersection of State and Third streets. While the parade is short in duration, motorists are encouraged to use Route 31 as an alternate route. MEMORIAL DAY PANCAKE BREAKFAST — While in Geneva, don’t forget the 64th annual Memorial Day pancake breakfast from 7 a.m. to 11 a.m. Monday, May 29, at the corner of South Third and Hamilton streets. THE MEMORIAL DAY PARADE kicks off at 11 a.m., starting at the Huntley Municipal Complex, 10987 Main St. As in previous years, the parade goes west on Main Street to Woodstock Street, turns right and disperses from here. The Huntley Square Gazebo will be the site of a brief ceremony. Sponsored by the American Legion Post 673. Maple Park Memorial Day Services: 9 a.m. to noon Monday, May 29, at various locations in Maple Park. Maple Park American Legion Post 312 members place American flags on the graves of service members and perform honors at six Maple Park cemeteries starting at 9 a.m., following at 15-minute intervals. The cemeteries are Pierce Cemetery, St. Mary’s Catholic Cemetery, Gardner Cemetery, Van Vlak Cemetery, Saints Peter and Paul’s Catholic Cemetery, and South Burlington Cemetery. From 11 a.m. to noon, a short service will be held at the post home, 203 Main St., Maple Park. After the services around 12:30 p.m., stop by the post for an open house featuring free hamburgers, hot dogs and fries. The 2017 Memorial Day Parade will be held at 10 a.m. Monday May 29, 2017. The parade begins at 6th and West Main Street. It then travels east to Riverside Avenue where it turns left (north) and will continue to the Freedom Walk north of the Police Department where a formal ceremony will be held. Main Street will be closed from 7th Street to 5th Avenue (Illinois Route 25) during the parade. Parking on the Main Street Bridge will be prohibited from 7 a.m. to 11 a.m. Vehicles parked on the bridge during those times will be ticketed and towed. Parking will also be prohibited on State Avenue between Riverside Avenue and North 4th Avenue to accommodate parade vehicles exiting the parade route. Traffic assistance will be provided by police and emergency management personnel stationed along the parade route. Motorists needing to cross the Fox River are encouraged to use either the Illinois Street Bridge or the Red Gate Bridge. Show your respect for our troops who have given their lives in service to our country at the St. Charles Memorial Day event Monday, May 29. Activities begin at 6 a.m. and include cemetery ceremonies, a parade, memorial service and free family picnic. Events are sponsored by the St. Charles VFW, American Legion and AMVETS Posts. Flag Raising and Cemetery Ceremonies — 6 a.m. The ceremony begins at Baker Community Center, 101 S. 2nd St., with Boy Scouts posting colors, Honor Guard and an honorary gun salute. Boy Scout troops will place flags on the grave sites of veterans at each of the cemeteries in St. Charles. Ceremonies begin at the South Cemetery (east side of 7th Ave., north of Madison), continue on to the North Cemetery (west side of IL Route 25/5th Avenue, north of Johnor Avenue), then conclude at the Union Cemetery (east side of IL 25/5th Avenue, north of Stonehedge Road). The parade steps off at 6th Street and Main Street, and continues to Riverside Avenue. Parade registration forms for groups that want to march in the parade are due May 12. Download a form here. Memorial Service — 10:45 a.m.
A special memorial service will immediately follow the parade at the Freedom Shrine along the river, west of the St. Charles Police Department, 211 N. Riverside Ave. In the case of inclement weather, the ceremony will be held inside the St. Charles Fire Station 1, at 112 N. Riverside Ave. The Memorial Service is led by Event Coordinator Lt. Colonel Mark Powell, (Ret). and will include Mayor Ray Rogina reading the Annual Proclamation, a keynote address from Colonel Jake Wyatt (Ret), and “Taps” played by resident Kevin Gaffney and his daughter Kacie, a junior at St Charles East High School. Free Family Picnic – 11:30 a.m.
An old-fashioned Family Picnic follows the conclusion of the Memorial Service at the historic Pottawatomie Park Pavilion from 11:30 a.m. to 1:30 p.m. Enjoy grilled brats and burgers from the Blue Goose, compliments of your local Veterans, and complimentary beverages and Culver’s Frozen Custard. Enjoy music by local musician Gregory Hyde. For more information about Memorial Day events, please contact Mark Powell at mpowell@onpathfinancial.com 630.329.6444. South Elgin Memorial Day Service: 10 a.m. Monday, May 29, at Panton Mill Park, 10 N. Water St., South Elgin. Led by South Elgin VFW Post 2327. In case of inclement weather, the event will be held in the municipal annex. Free.